Cllr David May convener of Infrastructure Services and I met in Forfar recently to discuss the impact of the recent prolonged cold snap on roads in Forfar and across Angus. The weather has resulted in a large and unexpected repair bill for Angus Council. Temparature in Angus dipped as low as -13°C, creating significant problems for the Council whilst working hard to keep the roads open and safe. Whilst the council had to find funds for an extra 13,000 tonnes of salt just to keep the county’s roads open, the sub-zero conditions also caused considerable damage to road surfaces and pavements, which can deteriorate at a rapid rate. 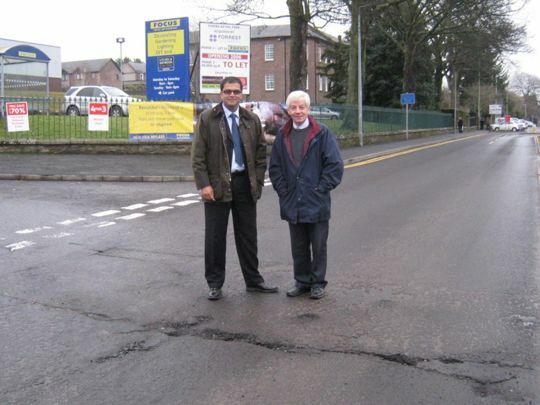 I know that the council are already auditing the roads and prioritising the repairs, working through them as quickly as they can. I would call on the Scottish SNP Government to revisit their financial priorities and support rural councils to ensure their roads are safe. In rural areas, such as Angus, the road system is crucial for residents, businesses and farmers. Never underestimate the dangers of old pot-holes by the way! A friend of mine accidentally fell down one (not in Angus) and ended up having a titanium plate fitted as a skull structure. Meanwhile, this looks like great work showing a clear sense of local community responsibility and a careful consideration of the use of public money.